Pat was contacted with an urgent biohazard remediation job, but he was not prepared for the scene he was about to enter. 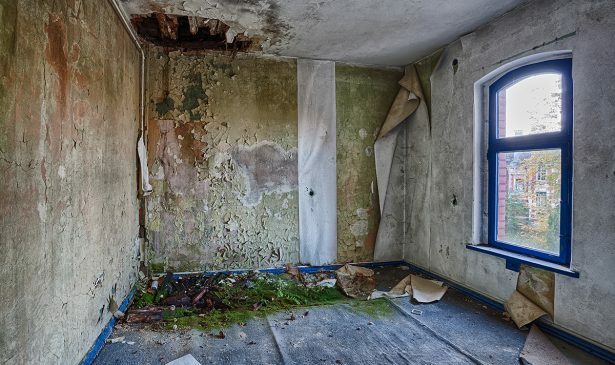 Mould covered the floors, walls and ceilings throughout all of the structures’ levels. The drywall from the ceilings collapsed in large areas, due to the weight of the untold gallons of water. By the start of 2018 a very dramatic story was unfolding for PuroClean of Winnipeg and Franchise Owner, Pat Jacob. Pat was contacted with an urgent biohazard remediation job, but he was not prepared for the scene he was about to enter. As it turned out, the homeowner passed of natural causes about 7 months prior to the call, and remained unfound until June, 2018. His sad passing was just the beginning of the story. Unfortunately for the home, when the deceased passed in the fall, the furnace was not turned on. As the weather got colder, the plumbing fixtures froze. As a more temperate spring arrived, the weather warmed and eventually thawed the water pipes, which had all burst from the freeze. Water ran freely throughout the structure for over 2 months. In June the police entered the home and discovered the body. As Pat first entered the residence, he was amazed at the level of complete damage. Mould covered the floors, walls and ceilings throughout all of the structures’ levels. The drywall from the ceilings collapsed in large areas, due to the weight of the untold gallons of water. The engineered hardwood floor was thoroughly saturated and delaminated. Mushrooms were growing happily in the living room area rug. The team sprang into immediate action, first running an extension cord from the neighbor’s house to get the sump pump up and running, to begin to drain the flooded basement. Then the cleanup began. All contents that could be saved were respectfully treated and carefully packed for the family, with the rest properly disposed of. All of the cabinetry throughout the kitchen and 4 bathroom vanities; wooden stair railings and custom millwork, including wooden framing for the kitchen island, bar and electric fireplace; all of the baseboards, trim and doors were removed. The walls and ceiling drywall; vapour barrier and insulation throughout; all flooring including carpet, tile and hardwood; and all of the subfloors in the bathrooms and the entire main floor subfloor were taken out and disposed of. Next, ­­­­­­­­­­­the crew began the task of removing all of the ductwork, the furnace and hot water heater, two fireplaces, one gas and one electric, two tiled showers, all four toilets, and all of the major appliances, which were non-salvageable. All in all, over 220 cubic yards of unsalvageable building material and contents were disposed of. All remaining surfaces, including the floor joists, were treated with our industry-leading sanitization products to stop further damage and thoroughly disinfect. The remaining wood was attentively cleaned by hand. The initial air quality test inside the structure indicated over 12,000 mould spores per cubic meter. As work progressed, they continued to evaluate the air quality throughout the process. Subsequent test results dropped drastically with each assessment, finally reaching just 138 spores per cubic meter. They finally declared the remediation complete.